So on Sunday 9th of August I was at Durham train station and in the ever so slow queue to get my ticket to head to Newcastle for some shopping. I pointed out to my sister this boy who was sitting back to the window and said 'he looks like he'd be attractive, even from just looking at him from behind'. Little did I know, I was about to see one of the most beautiful people I think I have ever seen. As we walked past, I casually glanced to see if my prediction was right and my goodness it was! If there are angels on earth, he is one of them. Dark blond hair, golden tan like he'd been to gthe south of France for a week, navy jumper and slightly rosy cheeks. He was literally everything I like. This is the question I so want you to please help me with. What do you do in this situation? You've just spotted someone you are mesmerised by. You don't want them to just slip back into obscurity because, they just don't come along every day, week, month, year, heck maybe ever! But social convention and general anxt is a strangely controlling and powerful force. It is exactly that which forced me and my glance away from as I passed by. It could be the start of a typical cheesy film, but it's not. It's real life. What would you do in this situation? My mum told me that in olden days, a lady would just drop her handkerchief in front of a potential suitor. Ettiquette would mean he'd stride after her calling 'Madam!' and gracefully hand it to her. Initial contact made, good talking point. Let the conversation commence! Unfortunately today dropping a tissue in front of them is unlikely to work, thanks to germ theory. So what happens? Then their train pulls up and this is all you can do, but won't because you're embarrassed. It can be difficult talking to complete stranger and maybe it's because we're not supposed to. Should these moments remain as exactly that? Passing moments. What would you do in a moment like this? 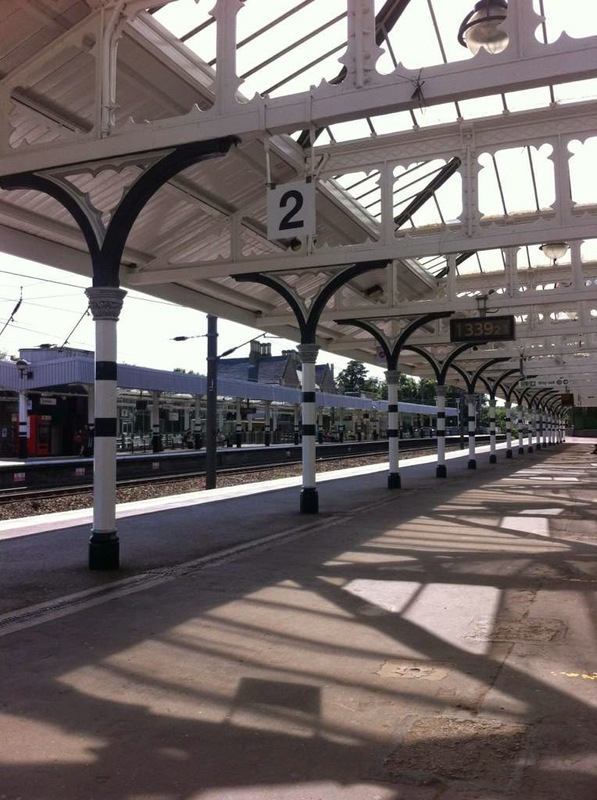 Photo of Durham station. We were on opposite platforms. Great post! I personally think I'd just talk to them and be like "hey didn't we meet at that party yesterday?" or something like that (even if you didn't: it's an excuse to talk to the guy) or indeed just do something that'll cause him to help you (like dropping a bunch of books instead of a handkerchief...or maybe trip but I don't know if the first impression you want to make is clumsy). Haha sorry I wasn't able to help! I think just saying something like you said, is a good idea. Thanks for the follow! I like this new word. Just like 'Carpe Diem' Seize the Day, this is what I will endeavour to do from now on. You're so right, in reality and the scheme of things it wouldn't matter what the outcome is, if it's going to work, it will do, right? It's so true, we only really regret the things we don't do. This is very good advice. I have taken it on board. You're right, a simple smile and hello is so simple and so effective. Thanks! Great post fun to read. I nominated you for the Liebster award on my blog. Please go check it out the questions will be on the post. I invite you to my blog! I am writing about books. I talk to writers. I encourage you to follow the blog. This will help me to continue development.